There has been an urgent need in consumer electronics for infrared optoelectronics including light emitting diodes and photodetectors. To date, however, infrared optoelectronics are served by costly CMOS incompatible III-V semiconductors. Recently a new class of semiconductors that address the CMOS compatibility issue has emerged based on colloidal quantum dots. When it comes to consumer electronics the use of RoHS compliant materials is a prerequisite and therefore there is a strong need for the development of high performance devices based on environmentally friendly elements, something that in the infrared had remained elusive. In a recent study published in Advanced Optical Materials, ICFO researchers Dr. Nengjie Huo, Dr. Alberto Figueroba, Dr. Y. Yang, Dr. Sotirios Christodoulou, Dr. Alexandros Stavrinadis, led by ICREA Prof at ICFO Gerasimos Konstantatos, in collaboration with Prof. C. Magén from Univ. of Zaragoza, have reported on the development of an infrared detector using Bismuth Sulphide, which has proven to have fast and high photo-response levels in the short-wave infrared range thanks to the formation of defects in the material. 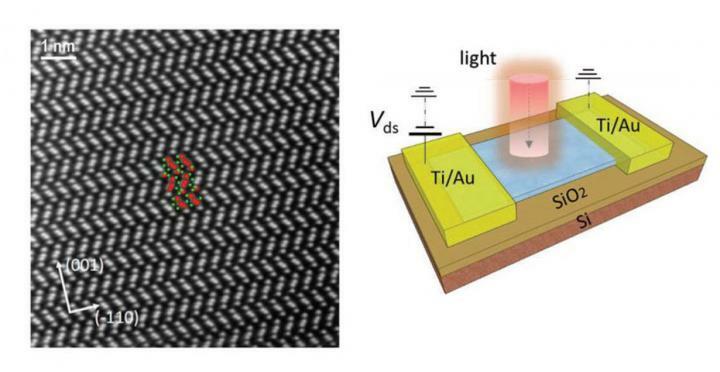 In their experiment, the team of researchers fabricated a photoconductive detector, depositing a very thin layer of Bi2S3 flakes onto a Si/SiO2 substrate. Once built, the team was able to observe that the Bi2S3 flakes possessed sulphur vacancies or defects in the material (sulphur-deficient), which created extended in-gap states, which allowed an increased absorption of light below the bandgap value of Bi2S3, that is sub-bandgap. Such features led to a high gain, low noise and, subsequently, a high sensitivity photodetector. ICFO – The Institute of Photonic Sciences was founded in 2002 by the Government of Catalonia and the Universitat Politècnica de Catalunya (UPC), both of which are members of its board of trustees along with the Cellex and Mir-Puig Foundations, philanthropic entities that have played a critical role in the advancement of the institute since 2007. Located in the Mediterranean Technology Park in the metropolitan area of Barcelona, the institute currently hosts 400 people, organized in 26 research groups in 60 state-of-the-art research laboratories. Research lines encompass diverse areas in which photonics plays a decisive role, with an emphasis on basic and applied themes relevant to medicine and biology, advanced imaging techniques, information technologies, a range of environmental sensors, tunable and ultra-fast lasers, quantum science, photovoltaics and the properties and applications of nano-materials such as graphene, among others. In addition to two state awarded Severo Ochoa accreditations of excellence, ICFOnians have been awarded 15 ICREA Professorships and 32 European Research Council grants. ICFO participates actively in the European Technological Platform Photonics21 and is also very proactive in fostering entrepreneurial activities, spin-off creation, and creating collaborations and links between industry and ICFO researchers. To date, ICFO has helped create 7 start-up companies.